Our journey to ‘Star Wars’ begins where it all began: the middle. As a kid born in ‘94, my radar wasn’t looking to detect sci-fi movies from the ‘70s. I was young, shallow and close-minded, and if the VFX weren’t on par with, let say, The Mummy Returns, you can bet that something from the decade my mother was born wasn’t going to grab me. In an attempt to culture me in the film that pioneered the great special effects that my eyes were treated to with, let’s say, Spider-Man, my dad decided to show me a VHS of A New Hope. I knew it was a classic, but I didn’t understand the hype. It wasn’t until one day (Star Wars Day) that I was immediately enamored with the series. This is before Disney’s acquisition, so, you know, I liked Star Wars after it was cool, but before it was revitalized. Spike ran a marathon of all six episodes, interlaced with commercials and all. I hit a point of maturity where special effects didn’t matter to me, instead I was more concerned with immersing myself in this universe that has engulfed the public en masse. I was eager to learn the origins of Luke, Han and Leia, and why characters like R2D2 and C3P0 were so beloved. That was around 2010, and since then, I’ve developed an adult lens for watching movies and TV shows. I recently bought digital copies of Episode I through Episode VI on impulse. Since then, I’ve only watched A New Hope, and from my dismissive mindset as a kid, to my curious viewing as a teen to my now fanboyist, yet mature outlook as an adult, I can say the re-viewing of A New Hope has the excitement for The Force Awakens rising even higher. 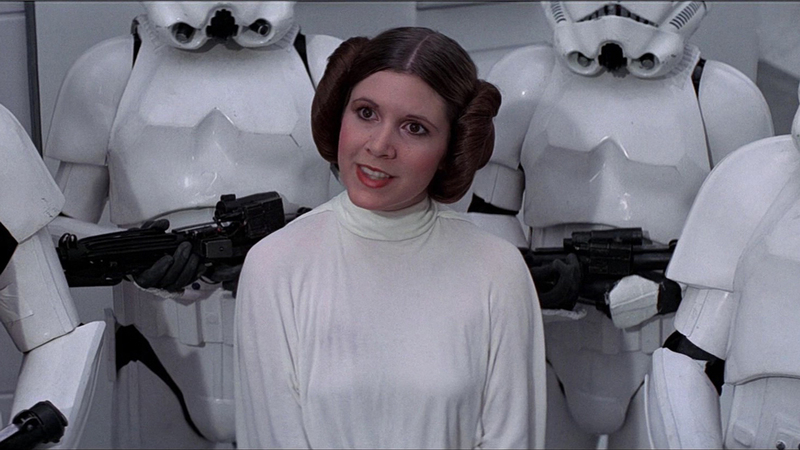 I’ve always been immersed in nerd culture, so lines like “Help me Obi-Wan Kenobi, you’re my only hope” and Chewbacca’s iconic one liners were always present and oft repeated. But finally watching the movie over again produced multiple aha moments for me. I understand there is so much history with this series, and given that I was born decades later unfortunately means the nostalgia just isn’t there for me. But even as a millennial constantly dropping beats of how young I am, I do have a deep level of respect for this series. 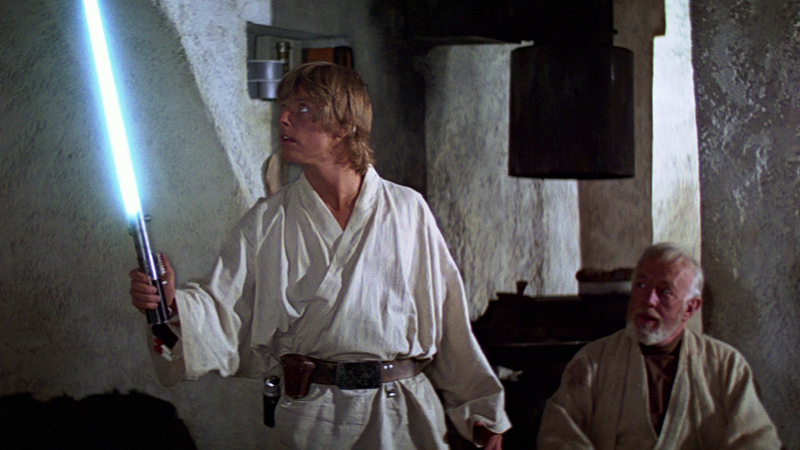 I loved seeing whiny Luke whine about power converters to badass hero Luke blowing up the Death Star. It’s baffling when you compare Leia to modern, female characters and have the one written in the ‘70s turn out to be far more progressive. And who doesn’t like Han Solo? I may not be able to wear a costume to the premiere of The Force Awakens, but I will proudly boast my t-shirt featuring him. Lastly, Darth Vader made his presence known with his evil, yet reserved, actions. All of these characters will no doubt be expounded on in the later movies, and now that includes The Force Awakens. Now with The Force Awakens hitting theaters next month, there’s no changing the script, of course, but there are elements from A New Hope that I would love to see included and avoided. I’ll start with the negative so we all can leave this article happy. Luke was an angsty little mess throughout the film. Not that I don’t want to see our protagonists struggle to the top, but let’s hope two hours of self-doubt is shied away from. Given that this is not one of the prequels, my complaints stop here. This film offered a lot, and I hope The Force Awakens is able to evoke the same pathos as this film. I would love to see the same rapport built between Han, Leia and Luke mirrored with Rey, Finn and Po (although Po may not be featured as heavily, rumors have it). I also liked that Leia, despite being captured, held her own. I hope we see Rey’s character follow this same beat. The Force Awakens is almost upon us, so stick with us as we journey ever closer to a galaxy far, far away with our post on Empire Strikes Back next week. Until then, may the force be with you. Is ‘A New Hope’ the best of the entire series? Were you ever sidetracked from going to Tosche Station to pick us some power converters? Tweet me @NerdDotMe. And be sure to follow us @YouNerded.